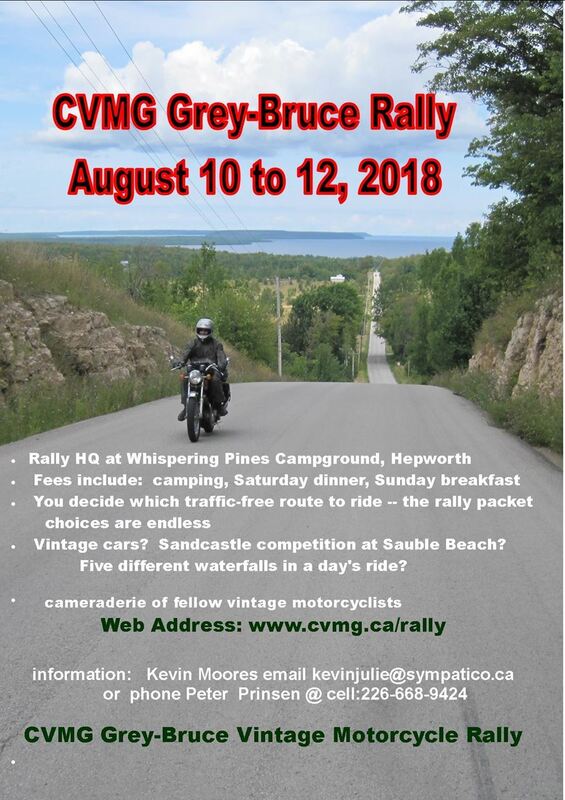 Welcome to the CVMG Grey-Bruce annual vintage motorcycle rally. The dates for our 2019 rally will be August 9 to 11. Be pro-active and put this date on your calendar. We are looking forward to this one. We thank all rallyers for joining us for this past August's rally in Grey-Bruce territory. Not to forget were the rally volunteers that tirelessly worked to make it a success. The weather did fully co-operate and now we are planning a "version 2019" for all Vintage motorcycle enthusiasts. Soon we will post a 2019 rally poster. The Above is overlooking Colpoys Bay, Griffith Island and White Cloud island from the lookout just South of Big Bay. Posing on his Norton is Pierre Masbou of Manitoulin island and Nickle Belt fame. To get a full-size map click at the top left "Full size map"
Above is the 2015 rally slide show. This slide show is of the 2014 rally. It was a bit wet, but the farmers told us they needed the rain. And it came!! And then here is the picture album for the 2013 Grey-Bruce section rally at Hepworth. Take a look at these brand new cabins below: They are available to the first 7 campers that apply to Whispering Pines at $75.00 per night per cabin. Phone 519-935-2571 or e-mail wpc@campontario.net first come, first served.